It’s quite something to realise that, flying in the face of accusations about how “this generation doesn’t care about politics”, you are watching a live stream of a Senate filibuster with over 180,000 other people. It’s quite another to realise that the media - run by the sort of baby boomers who spout those accusations - seemingly didn’t care. That was the scene last night here in the States as Sen. Wendy Davis staged a 13-hour filibuster to block an anti-choice bill (CSSB5) that would hamper or remove access to abortion for many women in Texas. The Texas Senate’s YouTube live stream was the place to be, as many of the major news networks evidently didn’t consider the filibuster worthy of coverage. Indeed, once the filibuster had reached, quite literally, its eleventh hour, CNN - arguably the “real news” network, at least compared to FOX and MSNBC - had more pressing issues to cover: like the calorie content of blueberry muffins. SB5’s attack on women’s reproductive rights, and Sen. Davis and her colleagues’ marathon effort to block it, apparently wasn’t newsworthy enough to break from their usual coverage. Instead, we watched it happen live on YouTube (and Twitter, Vine, Instagram, Livestream, Reddit and Tumblr), and what a show it was. Senate Bill 5 sought to “ban abortion after 20 weeks and make abortion clinics abide by the same standards as surgeries, [making] their doctors require admitting privileges in local hospitals”, and would have additionally led to the closure of 37 of Texas’ 42 existing abortion clinics. Fortunately, Sen. Davis and her colleagues saw the urgency of the issue. I tuned in around 1pm Los Angeles time, when Sen. Davis had already been speaking for four hours, and couldn’t tear myself away. Sen. Davis was reading letters aloud: testimonies from those who’d had abortions, or who’d had access to them blocked, or who’d had catastrophic backyard procedures because they were denied access to safe, legal abortion. One letter Sen. Davis read - about a teenage girl whose father called a local firefighter to perform her abortion, leaving her infertile - moved me to tears. It wouldn’t be the last time. The rules of the Texas Senate stated that - contrary to what you might have “learned” about filibusters via the work of Aaron Sorkin - Sen. Davis had to stay on topic, and had to stay standing, without accepting any assistance, leaning against her desk, taking a bathroom break, or even a drink of water. Naturally, the Republicans were keen to catch her out, with the main reason for a point of order (essentially, a “strike”) being a lack of germaneness: straying from the topic at hand. Astoundingly, the Republicans argued that Sen. Davis’ discussion of how SB5 would compound issues women face thanks to existing bills such as 2011’s sonogram bill (which became law in early 2012) was not germane. 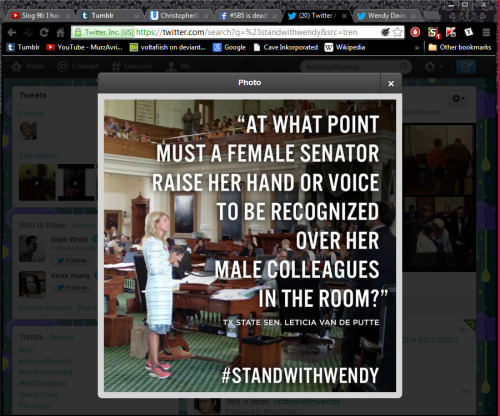 One of many Wendy Davis memes that flooded the internet yesterday. Fortunately, Sen. Davis was not fighting by herself. Sen. Rodney Ellis made numerous parliamentary inquiries as to whether Sen. Davis could read him the bill aloud, “slowly”, rather than have an aide give him a printed copy, because “I’m a slow learner, sir”. Sen. Kirk Watson - once named “Texas’ super-lawyer”, and the head of the Senate Democratic Caucus - regularly helped buy her time by asking in-depth questions about SB5; when the third point of order was upheld, he moved to overturn acting Senate President Lt. Gov. David Dewhurst’s motion and debated whether or not the topic of Sen. Davis third point of order was, in fact, non-germane. After Sen. Van de Putte effectively flummoxed the chair, the chamber erupted in cheers, a tide of applause that would eat up the remaining 15 minutes or so until midnight, after which it would be too late to pass the bill. That didn’t stop the Republicans from trying, as it turned out; despite the presence of reporters and Democrats - and 180,000 people watching live at home - who saw the clock tick over, Dewhurst claimed that the vote on SB5 had been started prior to midnight. Mercifully, this led to a meeting that eventually found that, no, SB5 had not passed, as the voting (despite the Republicans attempts to change the timestamps) had begun on June 26th. So, in the end, Sen. Davis stood her ground for 15 hours, not 13, and her marathon filibuster did indeed block SB5 from passing. But, as is often the case in US politics, the silver lining that was the successful filibuster turned out to be followed by an immensely dark cloud, as this morning the Supreme Court “struck down a portion of the Voting Rights Act that kept discriminatory voting laws from going into effect in areas of the country with histories of disenfranchisement. That includes states like Texas, where in 2011 the GOP sought to change the demographic composition of Davis’ district, who was elected in 2008 with strong support from minority voters”. As ThinkProgress’ coverage notes, that could be sad news for Sen. Davis, as Texas will “advance a voter ID law and the very same redistricting map that was designed to keep Davis out of office”, but it’s far worse news for the many People of Colour in Texas - not to mention PoC, the poor, ill, isolated and elderly in other states - who now find themselves at best unable to form a voting majority and at worst disenfranchised. And if you thought network news seemed to take only a passing interest in Sen. Davis’ fight on behalf of Texas women, chances are they will care even less about this. If seemingly the entire internet can #standwithwendy, let’s hope that rage can be maintained to #stand with those affected by #VRA.